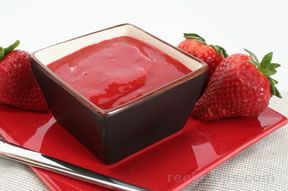 This is a simple strawberry sauce that makes a great topping for ice cream, shortcake, angel food cake, waffles, and pancakes. Clean strawberries and remove stems and cores. Cut berries into quarters and place in a bowl. 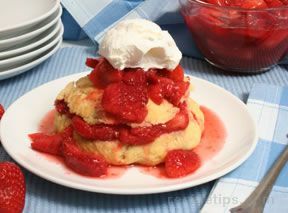 Slightly mash the strawberries using a fork, potato masher, or a pastry blender. Sprinkle the berries with the sugar and stir until dissolved. 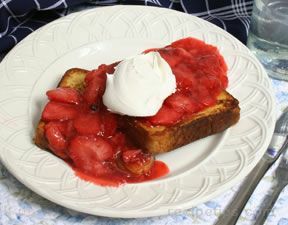 If the berries are very sweet, you may want to cut the sugar back to 1/2 cup instead of 2/3 cup. Place the strawberries in the refrigerator and allow to stand for 1 to 2 hours. 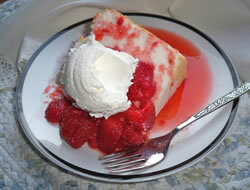 After the strawberries have been standing, remove them from the refrigerator. They should be juicier than when they were put into the refrigerator. Mash the strawberries again until they are the desired consistency. Taste for sweetness. If more sugar is wanted, add 1 teaspoon at a time, stir, and taste again. When sufficently sweetened, the sauce is ready to use.